The Health and Social Care Board (HSCB) has contracts with over 250 ophthalmic practices across the region to provide general ophthalmic services for Health Service patients. The HSCB also plans and develops a range of special enhanced services to help manage increasing demands for eye health services. On this page you will find information on service developments in eye health, and links to information and advice on eye health and care services. Developing Eye-care Partnerships (DEP) is the term used for the implementation of the five year plan for improving the commissioning and provision of eye health care services in Northern Ireland. Find out more about Developing Eye-care Partnerships. There are a range of professionals involved in looking after your eye health including, optometrists, dispensing opticians and other staff. 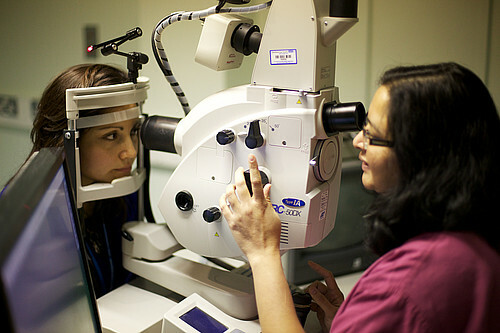 Find out more about eye-care professionals. It is important that you consider your eye health as you do for the rest of your body. Many eye conditions and problems are linked to other medical conditions such as diabetes and hypertension. Smoking is linked to eye disease and sight loss, with smokers being four times more likely to have macular degeneration. Loss of sight is something which we all fear and want to avoid. Could you be entitled to free Health Service sight tests?